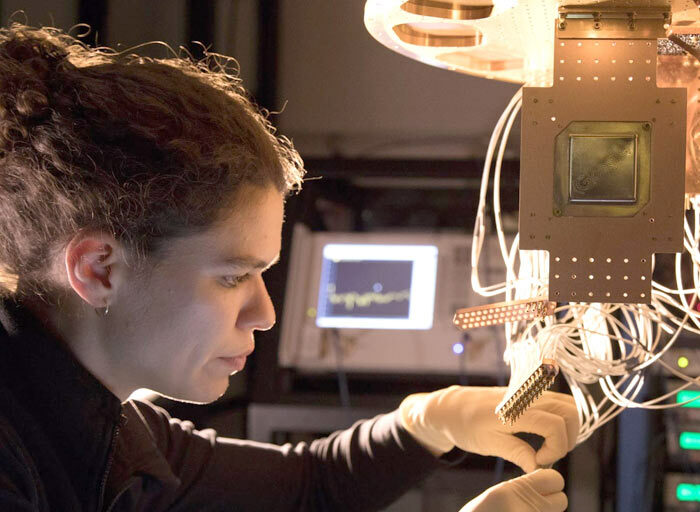 Google has refined and developed its 9-qubit linear array technology to create Bristlecone, a 72 qubit quantum processor. It presented Bristlecone at the annual American Physical Society meeting in Los Angeles. The new processor takes the attractive low error rate qualities of its predecessor, and it is hoped that using the new processor Google will be able to demonstrate quantum supremacy. Bristlecone is Google’s newest quantum processor (left). On the right is a cartoon of the device: each “X” represents a qubit, with nearest neighbor connectivity. Bristlecone is a gate-based superconducting processor system. It was designed to preserve the underlying physics of Google's previous 9-qubit linear array technology with low error rates for readout (1 per cent), single-qubit gates (0.1 per cent) and two-qubit gates (0.6 per cent). As you can see above the processor uses a square array of 92 qubits (9 x 8). 2D conceptual chart showing the relationship between error rate and number of qubits. near-term applications on the road to building an error corrected quantum computer. Google reckons that if its Bristlecone processor can work with a low enough error rate it should comfortably be able to demonstrate quantum supremacy in the not-too-distant future. Quantum supremacy is simply outperforming a classical supercomputer on a well-defined computer science problem. It is thought that quantum supremacy can be comfortably demonstrated with 49 qubits, a circuit depth exceeding 40, and a two-qubit error below 0.5 per cent - thus a 72 qubits processor should be able to achieve this goal more comfortably. Needless to say, the achievement of quantum supremacy will be a significant milestone for the industry. We are warned that there are still plenty of hurdles between Google and its supreme goal. "Operating a device such as Bristlecone at low system error requires harmony between a full stack of technology ranging from software and control electronics to the processor itself," says the Google Research Blog. Several iterations of Bristlecone and supporting hardware and software are expected to be needed along the road but Google's researchers are "cautiously optimistic," they will succeed. Intel is also at the American Physical Society meeting in LA. The chipmaker has seven sessions booked at the event, all with a focus on Quantum computing. Intel boss Brian Krzanich linked to a news fact sheet (PDF) via his Twitter account so you can read more about what will be discussed by Intel at APS over the next few days. We might or might have not been here before!? Can i be the first to mention the word “Crysis”. Actually a law is needed similar to Godwins Law that once Crysis is mentioned ….